Wiggling while handcuffed. Bracing one hand on the steering wheel during the arrest. Yelling at an officer. All these actions have led to people being prosecuted for “assaulting a police officer” in Washington, D.C., where the offense is defined as including not just physical assault but also “resisting, opposing, impeding, intimidating or interfering” with law enforcement. A five-month investigation by WAMU 88.5 News and the Investigative Reporting Workshop at American University, co-produced by Reveal, documented and analyzed nearly 2,000 cases with charges of assaulting a police officer. The results raise concerns about the use or overuse of the charge. Some defense attorneys see troubling indicators in these numbers, alleging that the law is being used as a tactic to cover up police abuse and civil-rights violations. • Ninety percent of those charged with assaulting a police officer were black, although black residents comprise only half of the city's population. • Nearly two-thirds of those arrested for assaulting an officer weren't charged with any other crime, raising questions about whether police had legal justification to stop the person. • About 1 in 4 people charged with a misdemeanor for assaulting a police officer required medical attention after their arrest, a higher rate than the 1 in 5 officers reporting injury from the interactions. • The District uses the charge of assaulting a police officer almost three times more than cities of comparable size, according to a 2013 FBI report and Metropolitan Police Department (MPD) numbers. • Prosecutors declined to press charges in more than 40 percent of the arrests for assaulting an officer. "The APO statute results in more injustice than almost any other statute that I can think about,” said John Copacino, a professor and director of the Criminal Justice Clinic at Georgetown Law School. “Police officers have a legitimate need to be protected from being assaulted, but this statute goes too far and criminalizes too much." Copacino said many cases arise from a typical human response to being unjustifiably stopped by an officer, yet District residents do not have the right to resist an unlawful arrest. “When [police] are clearly arresting someone for no reason, if the person resists by pulling away, by not putting his hands behind his back when the police officer grabs him to try to handcuff him, that becomes a crime in itself,” he said. Terrell Hargraves with his son, Terrell Jr., spent nine months in jail awaiting trial for a charge of assaulting a police officer. A judge ultimately found him not guilty. Terrell Hargraves lived through such a scenario when he had trouble moving into the handcuff position because of nerve damage in his shoulder. On Sept. 30, 2011, two MPD patrol officers said they saw something “suspicious” in the way the 35-year-old riding in the car ahead of them looked around before his friend dropped him off “in a high crime area” on Minnesota Avenue. “Officers recognized this behavior as consistent with that of flight from police to evade apprehension or interrogation,” they wrote in the police affidavit. Hargraves wanted to stop at the convenience store to buy a pack of cigarettes before a party at his grandmother’s house a block away, he said in an interview. He had taken only a few steps away from the car when he heard an approaching officer order him to the ground. Bewildered, he asked why, at which point the officer pulled out handcuffs. Struggling to cuff Hargraves’ injured arm, the officer deployed a metal baton and began striking his legs repeatedly. A second officer arrived, and together they used “the minimum amount of force necessary” to detain their suspect, they wrote in the affidavit. He was charged with assaulting a police officer for pulling away from the officer’s grip. Hargraves spent nine months in jail awaiting trial because when he was arrested, he was 30 days shy of completing three years on parole for a past conviction of fleeing a police officer. He lost his job. He missed the birth of his son. A judge ultimately found him not guilty at trial. Still, most defendants arrested for assaulting an officer face a monumental challenge defeating the charge, even when the judge believes the person behaved reasonably. Emanual Wilson was tackled and arrested for assaulting an officer the moment he stepped out of a car during a traffic stop. The police were arresting his pregnant girlfriend for driving with a suspended license. Wilson couldn’t see what the police were doing but could hear his girlfriend yelling that she was pregnant and not to touch her. A conviction for assaulting a police officer carries different connotations than interfering with one and can impact future employment prospects, security clearances, home loans or anything that requires a criminal background check. “The real horror about the assault on a police officer statute is that we have thousands of people in our community who are now facing lifelong consequences for what really is harmless conduct,” said Patrice Sulton, a criminal defense attorney who frequently assists the District branch of the NAACP. But enforcement is not distributed equally. A 2013 report by the Washington Lawyers’ Committee found that black people represented eight in 10 of all those arrested in the District. The WAMU-IRW investigation found an even larger disparity in cases of assaulting police officer: 90 percent of those charged from 2012 through 2014 were black. The District uses the charge of assaulting a police officer almost three times more than cities of comparable size. Community tensions haven’t sparked an epidemic of attacks on law enforcement in Washington, but the rate for assaulting police officer cases runs roughly three times higher in the District than in cities of comparable size, according to an FBI report and the MPD’s own statistics. The ACLU of the Nation’s Capital examined assaulting police officer statutes in the country’s 50 largest police jurisdictions, determining that the District’s “is among the broadest in the country because it encompasses a range of behaviors that go beyond assault,” said Program Director Seema Sadanandan. The District law wasn’t always unique. In the 19th and early 20th centuries, the statute more closely resembled the modern standard elsewhere — narrowly defined to punish acts of violence against police officers. But amid the onset of white flight to the suburbs and black migration from the Deep South, Congress broadened the scope in 1953 to include resisting, opposing, impeding, intimidating or interfering. Civil rights marches and anti-war protests were roiling the District in the early 1970s when the law was further amended to remove the right to resist an unlawful arrest. The number of arrests started to climb after the D.C. Council enacted a misdemeanor option in 2007. From 2012 through 2014, more than 80 percent — and likely more — of the charges of assaulting a police officer cases were found in misdemeanor court, according to our investigation. The definition of “police officer” has also been broadened over the years to include an array of law enforcement and other public servants, from Secret Service and U.S. National Park Service Police to emergency medical technicians and private security guards. Bad stops turn into legitimate arrests? During the three-year period of cases examined, nearly two-thirds of those arrested for assaulting a police officer weren’t charged with any other crimes. That statistic marked a red flag to more than a half-dozen criminal defense attorneys interviewed for this project. However, Sgt. Delroy Burton, head of the local police union, disagrees with the conclusions of defense attorneys. “To look at some cold numbers and conclude, ‘Well, this is troubling,’ in my view, tells me they are making some type of political statement,” he said. Forty percent of those arrested for assaulting a police officer from 2012-2014 had those charges “no papered,” meaning that they were arrested and booked by the police but prosecutors did not formally file charges. The police union chief also pushed back against the finding that more suspects arrested for misdemeanor charges of assaulting an officer require medical treatment than do the officers they reportedly assaulted. Burton points out that affidavits may mention a trip to the hospital if, for example, a diabetic is arrested without his or her insulin. Warren Cooper ended up in the hospital after calling for police assistance while trying to retrieve his possessions from an ex-girlfriend. Cooper, a Navy veteran with nearly 20 years of service and experience as a military police officer, is currently pursuing a college degree in business. But on July 15, 2013, two police officers viewed him as a threat. John M. Copacino is the director of the Criminal Justice Clinic at Georgetown Law: “It's not infrequent that our clients get beaten up by the police in the course of a stop, and we come out of it with a charge of APO." After officers responding to his 911 call informed him that his ex-girlfriend denied having his belongings, Cooper asked that they go to her apartment together. Cooper was in the hospital when he learned that the officers had charged him with assaulting them. “It was crazy. I read the paperwork. And everything in the paperwork was a lie. Total bald-faced lie,” he said. A security camera at his ex-girlfriend’s apartment building recorded the encounter, although he has never seen the footage because prosecutors dismissed the case before trial. Cooper was hospitalized for a week, hooked up to intravenous antibiotics because a cut from the baton led to an aggressive infection that caused his entire leg to swell. Recovering from his injuries caused him to miss so much school that he lost his standing and nearly quit. Additional training would improve individual misbehavior, but matters of community relations run much bigger than one officer. As a former police officer and current adviser on best practices, Ron Hampton favors a community policing approach, and uses his own 23 years of experience as an MPD officer to illustrate its benefits. When he was an officer in the District, Hampton policed his own neighborhood. He says that gave him “a vested interest” in both the security and well-being of others in his neighborhood, which helped him develop a mutual bond of trust with an expansive network of local contacts. These days, police officers tend to live in the suburbs, in part because living well in the city can be prohibitively expensive. 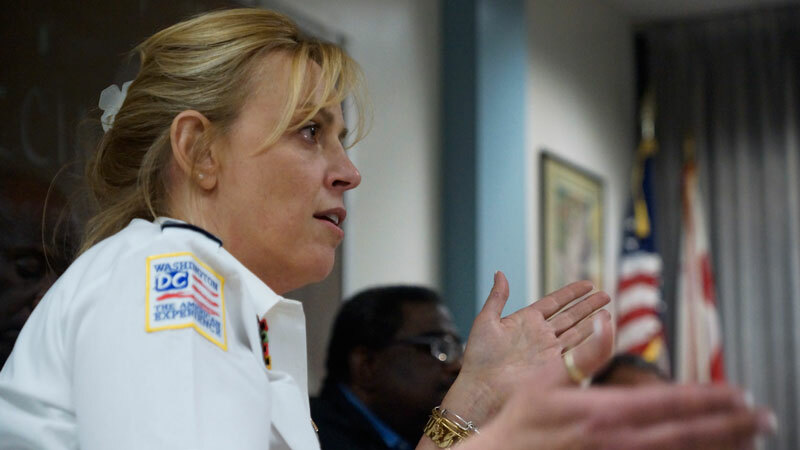 But MPD could face significant challenges recruiting personnel from neighborhoods that would benefit most from community policing because high arrest rates diminish the pool of potential candidates with clean records. The police could have had an ideal recruit in William Kenley — until he was arrested for assaulting a police officer. 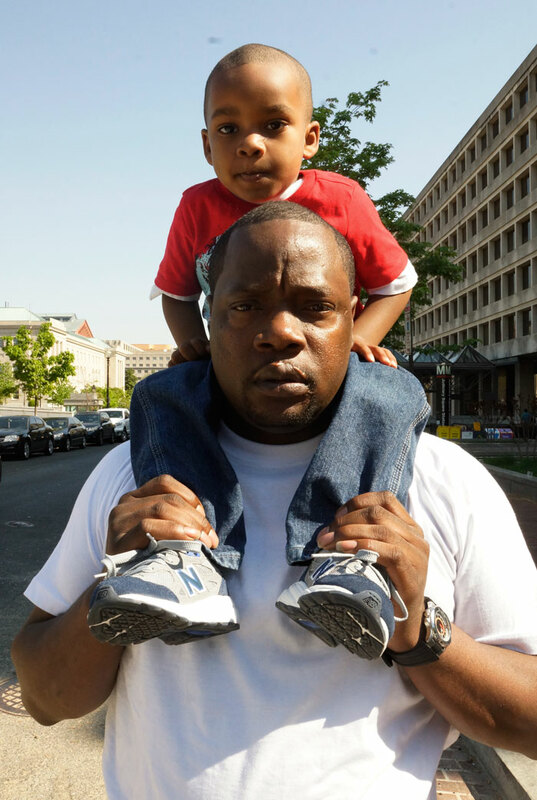 Kenley grew up in Northeast DC aspiring to become a police officer. He pursued a criminology degree at the University of the District of Columbia and is employed as a correctional officer. A fellow correctional officer was coming by to visit on June 20, 2013, when police stopped him in front of Kenley’s house. Kenley started filming with his phone when the officers got rough with his friend. The last few frames of the short video show an officer charging toward him. Kenley said the officer hit the phone out of his hand and knocked him to the ground. Ten minutes later, the officer approached again and put him in handcuffs, arresting him for allegedly ordering his dog to attack the officers. But the officers had initially failed to turn over to prosecutors a witness statement that contradicted the police version of events. The case against Kenley was dismissed before trial. Beating the charges doesn’t mean he escaped the experience unscathed. Because of the arrest, Kenley was suspended from his corrections job for three months without pay. And he no longer dreams of joining the MPD. Even if he still had that ambition, he believes the arrest would make him an unattractive candidate. David Donald, Christina Animashaun, Mariam Baksh, Meldon Jones, Ly Le, Amber Liu, Pietro Lombardi and Miranda Alyse Strong contributed to this story.